Are looking for a one-credit professional development course? Sign up for the Knowledge Mobilization Studio next semester! The one-credit course provides graduate students and postdoctoral scholars the opportunity to learn and use a knowledge mobilization framework to draw connections between their disciplinary research and a broad range of end-users. 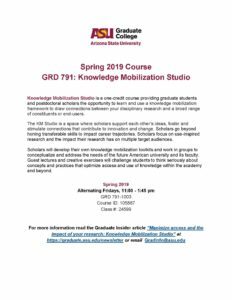 The class, GRD 791: Knowledge Mobilization Studio, will meet alternating Fridays from 11:50 a.m.–1:45 p.m.
Find in your class search with Course ID 105887 or Class Number 24599. 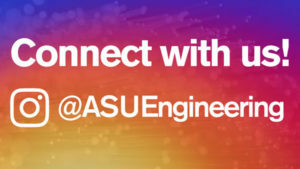 See how other ASU students are mobilizing their research.